What’s on your checklist of “must haves” for your dream Hawaii home? Do you just have to have Pacific Ocean sunset views? Do you prefer a spacious open floor plan? Looking for privacy? Or perhaps you need a Big Island home that includes an additional mother-in-law unit for an older family member, or visiting house guests? Perched atop Maliu Ridge, the views from this North Kohala home are absolutely breathtaking. 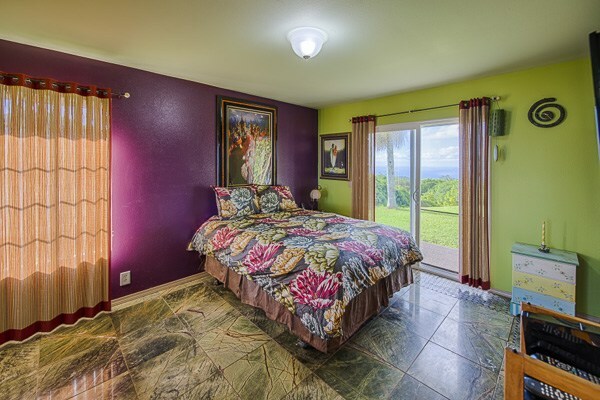 If these items are on your house hunting must have list, then you’ll want to check out this lovely North Kohala home for sale. Perched atop Maliu Ridge in Hawi, this spacious single-story 4 bed, 3.5 bath home encompasses 3,340 square feet of living space. 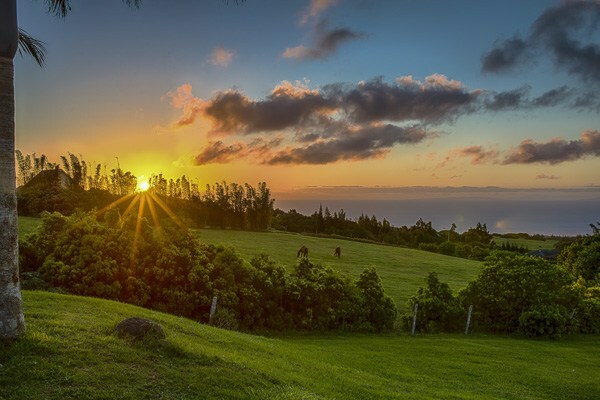 Nestled on 2.4 acres near the town of Hawi, this secluded property (MLS# 256438) offers absolutely breathtaking ocean and sunset views with the island of Maui in the background! 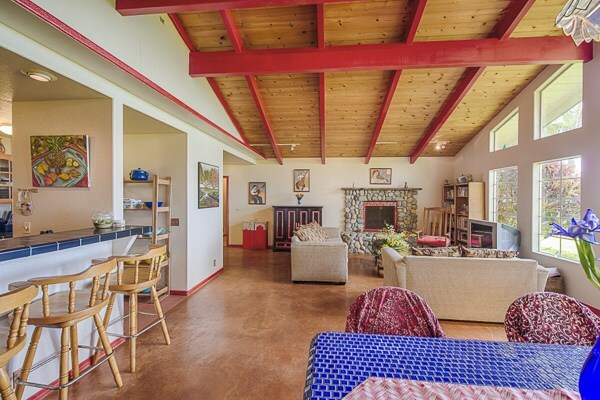 The spacious great room in this North Kohala home features a fireplace and stunning ocean views. The main house offers plenty of room for entertaining with a large separate family room. The well-appointed kitchen overlooks the great room, which contains a vaulted wood beam ceiling and a wall of floor-to-ceiling windows – all to take full advantage of those incredible views. A 1 bed, 1 bath apartment is fully detached from the main house and connected by a tropical breezeway. This is perfect for those looking for a separate space for an office, or mother-in-law suite for people taking care of older relatives who want their own space. The property includes a detached 1 bedroom apartment with comfortable living areas. People often view their home as a sanctuary from the stresses of life, and this North Kohala home is truly a private retreat! Grown palms and Norfolk pine trees provide a natural privacy barrier that is reinforced with a fully fenced yard and gated driveway. Enjoy ocean views from the master bedroom. What’s more the large yard containing rich, fertile soil is perfect for growing all sorts of tropical fruits and vegetables, including avocado, lilikoi, mango, banana, and macadamia nut trees. 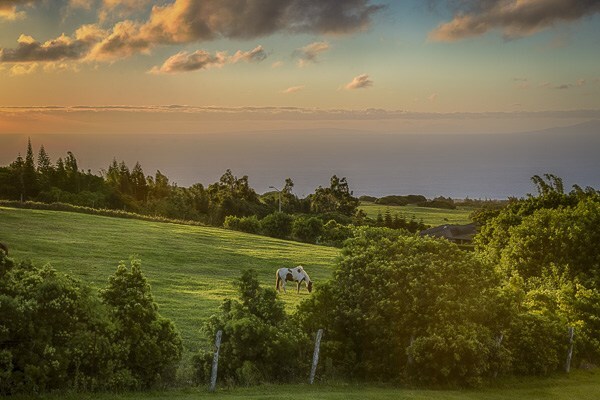 Maliu Ridge is just a short distance from the quaint town of Hawi with its boutiques, art galleries, and restaurants. The town of Waimea, the main business, economic, and cultural hub of the district, which contains several shops, a theater, and restaurants, is about a 20-30 minute drive. With light and airy living spaces, absolutely fantastic ocean and sunset views, plus a detached 1 bedroom guesthouse, this lovely Big Island property checks a lot of boxes on a house hunter’s “must have” list. Offered at $1.2 million, this exceptional North Kohala home is sure to please. 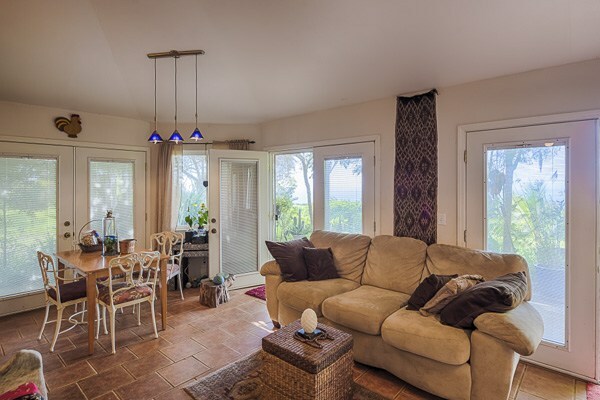 If you’d like more information on this delightful Hawi home for sale, or other Kohala Coast properties, give me a call today at (808) 937-7246 or email me.